I really adore Courtney Summers. I've read her previous two books, Cracked Up To Be and Some Girls Are and I absolutely adored them both (but especially Some Girls Are). I think she writes really emotional, if slightly gritty contemporary fiction amazingly well and I think I will always be excited to read any new books that come out from her. And Fall For Anything was no exception. 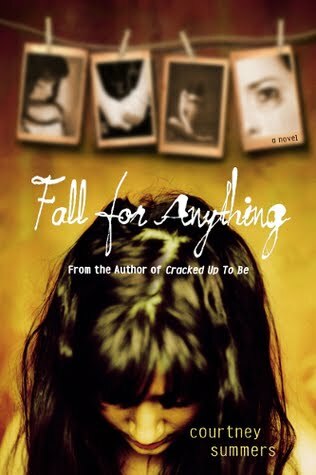 While not as emotionally moving as Some Girls Are was for me (and I think that would be incredibly hard to do), I was still immediately hooked into the more subtle and haunting story and into the characters of Fall For Anything. Everything about Courtney Summers' stories feels like it's written with jagged edges and broken glass. Witnessing Eddie Reeves' grief over the death of her father was almost painful to witness. All of the confusion and despair that Eddie feels is so realistic and believeable that I began to feel sad and confused and frustrated and angry, just like Eddie. I think Courtney Summers is incredibly talented in order to accomplish that. When her father commits suicide, it sends Eddie into overdrive trying to fit together the missing pieces of her father's life in order to work out why? Why does a successful photographer with a great amount of talent and a family that adores him take his own life? There must be a reason, and Eddie feels as if she could learn the answers by studying his photographs or visiting the place where it happened. She just can't let go of her burning questions, so consumed she is by her own grief. So when she meets Culler Evans, a charming but off-balance former student of her father's, she's propelled on this crazy mission despite everything. I couldn't look away from how wild and all-consuming Eddie is in exploring every aspect of her father's life and suicide, searching for answers that aren't there. She becomes obsessed with this, forgetting that other people in her life have lost someone as well. Eddie's mother needs help in order to manage on her own, and Eddie pushes away her best friend, Milo, when he refuses to discuss with her what exactly happened when Eddie found her father's body. Fall For Anything is such a sad but beautifully written book that will pull readers immediately into the heart of of a girl broken by a huge tragedy. This one comes recommended from me. Lovely review, and I completely agree with all of it. It amazes me how Courtney Summers' books are relatively short but she manages to convey so much meaning and mood and you end up feeling like you completely know her characters. I hadn't heard of Courtney Summers, think I'll be adding her to my list to investigate! Great review, this book sounds excellent. Lauren - Oh absolutely. I adore Courtney Summers and the way she always makes me feel and I get so absorbed in her books. It's incredible. She's incredible. Jenni - Oh you must find her books! I think I've spotted her first book, Cracked Up to Be in UK libraries at least!